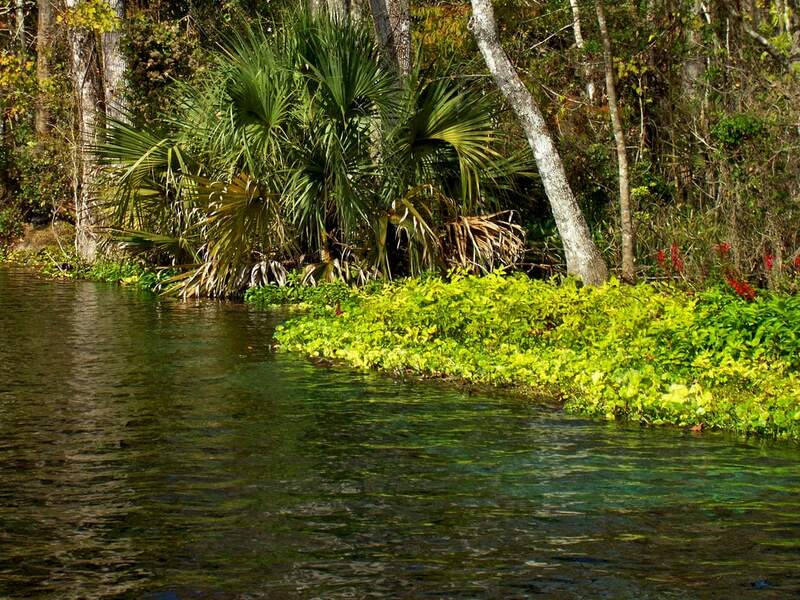 Florida has some of the most powerful springs in the world and one of the most powerful springs with a single main mouth are Silver Springs near Ocala, a well known natural monument that has been developed as a resort. 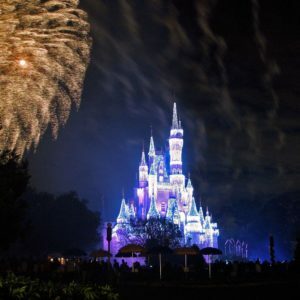 It was the top attraction in Florida before Disneyland. It is possible that this is the most powerful spring in the world. 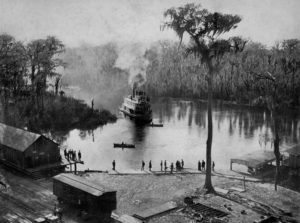 Northeast from Ocala city is a patch of natural Florida jungle with a true miracle located in the middle of it: a spring of gargantuan size which is discharged from a deep blue funnel, forming a wonderful lake and a fast flowing medium sized river, which smaller ships can navigate. Every second, this unbelievable spring discharges 23 cubic meters of crystal clear water. This amount of water would be enough for the everyday needs of 16 or 17 million average citizens of Earth: e.g. it could supply the whole nation of the Netherlands with water! Or – it could be enough for 3.3 million urban Americans, whose lifestyle leads to more water consumption. The water has a constant temperature of 23 °C and comes from five underwater spouts and numerous smaller sources. abundant rainfall – an average of 1360 mm per year. London gets 580 mm per year. 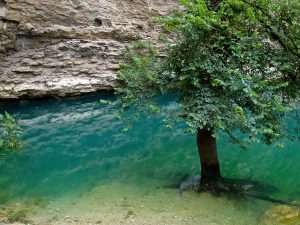 limestone ground – porous limestone filtrates water but it is also slowly dissolved, allowing for the artesian water to form channels and even large voids filled with fast flowing streams of clear water. In places where these streams reach the surface, we see enormous, powerful springs. Silver Springs discharges from a 20 metre long and 3.6 metre high cavern. There are numerous smaller discharges nearby as well. The Silver Springs are filled with life. The unusul conditions have formed an unusual biotope. Even more interesting are the remnants of extinct animals found in the spring deposits. Near the springs and even in the stream formed by springs, petrified remains of extinct elephants, mastodons and other animals have been found that are more than 10000 years old. These animals came to the springs in prehistoric times and drowned there. The tragedy of the past creates an entertaining scientific adventure for today: what could be more exciting than searching for the remains of extinct mastodons in the crystal clear water of a gargantuan spring?! This unusual monument of nature has been shrine for local Indians for many generations. Floating over the spring in a boat with a transparent bottom is an unusual experience. The water is as clear as the air and the bottom of lake feels, not 12 metres deep but, within touch. The warm water is teaming with colourful fishes and plants. The lake itself is beautiful: the deep blue, clear body of water is surrounded with natural jungle. This unusual beauty excited the explorers of this area and enterprising Americans developed a business selling this beauty: a specific theme park entirely devoted to this miracle of nature with a contemporary name: Silver Springs Nature Theme Park. 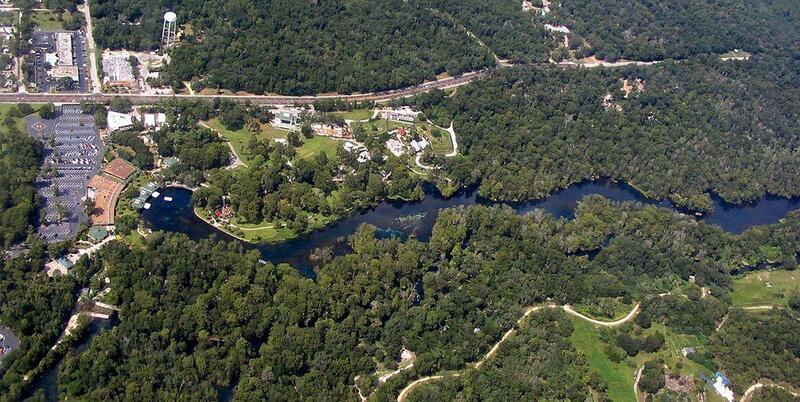 The history of this park started shortly after the Seminole Indians were “pacified”. In 1860s, entrepreneur Hubbard H. Hart managed to get conventional steamboats (first was stern-paddled steambot “James Burt”) into Silver Springs. This undertaking was highly successful as numerous tourists flocked to see this unusual natural monument. In 1878, Hullam Jones introduced glass bottom boats. Soon hotels were being built and other tourism related businesses grew around the spring. The whole world has seen the spring in movies about the adventures of Tarzan: in 1930s and 1940s six Tarzan movies starring Johnny Weissmuller were filmed here. This comfortable location (after all production teams love nice hotels too!) has also been used for numerous other movies. In 1938, the unusually clear spring water inspired photographer Bruce Mozert to create a series of unusual pictures where people were under water… but behaving as if there was no water! He continued this for 45 years, creating numerous exciting pictures of extremely high quality. Today Silver Springs represent an unusual cocktail of man made tourist attractions (e.g. the World of Bears, Twister flume ride etc.) and the unsurpassed wonder of nature in the spring itself. Gene M.Burnett. Florida’s Past: People and Events That Shaped The State. 1991. During the heyday of Florida theme parks, Bruce Mozert created some of the most memorable kitsch photography of the era. His underwater shots of beautiful models in crystal-clear waters were sent out on wire services and helped establish Silver Springs as Florida’s premier tourist attraction. 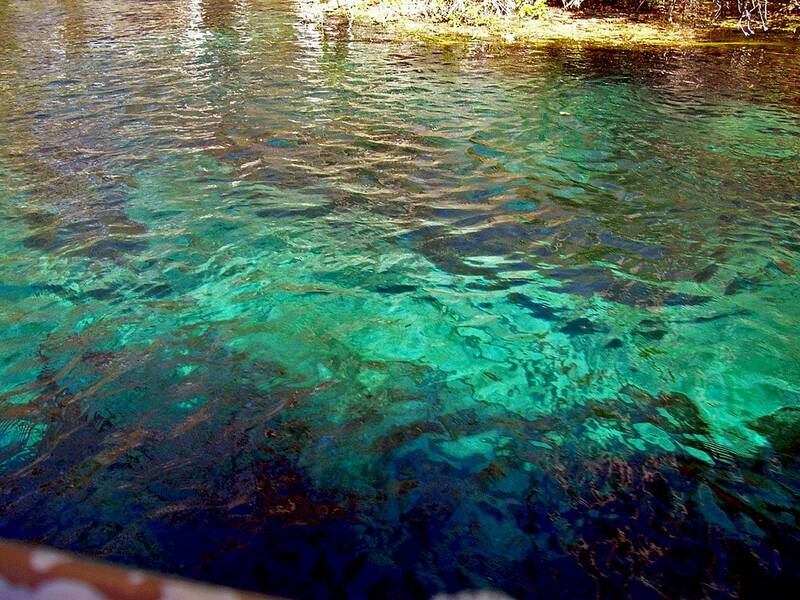 The deepest and largest known springs in the world are found in Florida. This book is a guided tour of theese beautiful environments, offering many rare underwater photographs. Beginning with a history of the formation of Florida’s springs eons ago and ending with a strong caution on cave diving safety, the reader journeys through these crystal realms, the emphasis always on the natural inhabitants. With many striking photos of these creatures in their natural habitat, this book also serves as a field guide for identification.